The Beacon Ridge course is a par 72, 6494 yard championship golf course featuring rolling fairways and splendid greens and recently was awarded Golf Digest's coveted Four-Star Rating. The Beacon Ridge clubhouse, a Mt. Vernon style manor,overlooking the Beacon Ridge course layout, features spaciously comfortable facilities and a gracious, relaxed style. 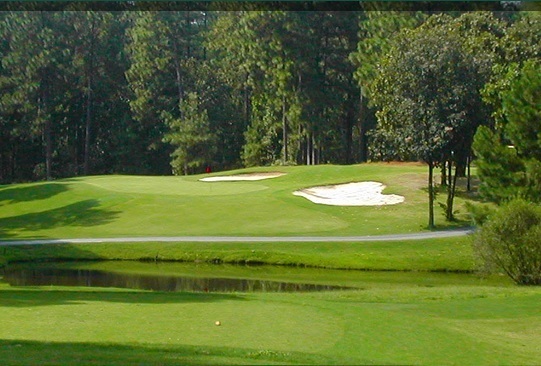 Experience the challenge of traditional Village of Pinehurst area golf when you tee it up at Beacon Ridge Golf and County Club. This classic layout provides a challenge to golfers of every ability as it meanders through the towering pines and rolling mounds of the North Carolina Sandhills. Beacon Ridge has Penncross Bentgrass greens, Bermuda fairways and tees, and a par 72 with each nine returning to the clubhouse.